Peachy Peanut Butter Pockets | JPMA, Inc.
Cut pitas in half to make 4 pockets and warm in the microwave for about 10 seconds to make them softer. Carefully open each pocket and spread a thin layer of peanut butter on the inside. Fill with a combination of apple, banana, and peach slices. Serve. 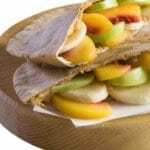 Try these pitas with other fruits such as nectarines, grapes, strawberries, or kiwifruit.